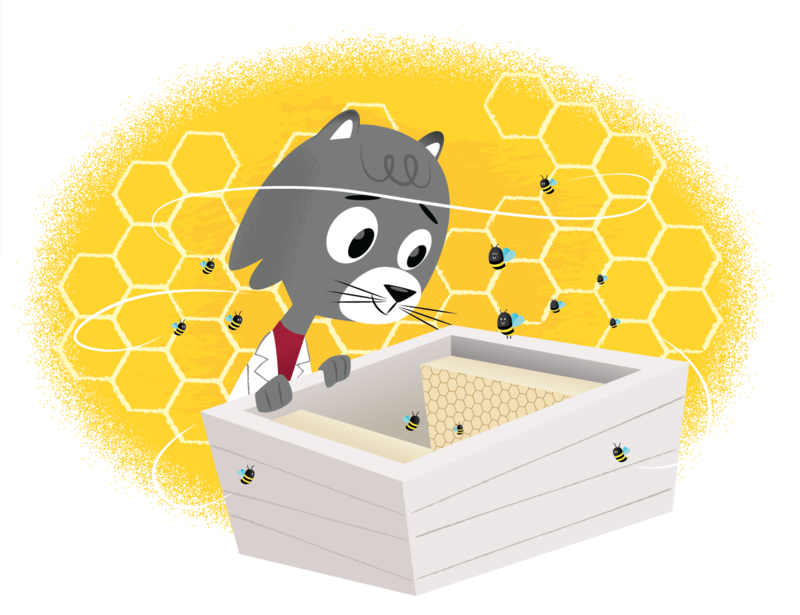 University Communications Network > Ask Dr. Universe > Where do bees sleep? Sleep is important for lots of the animals on our planet. Just like you need a good rest, so do bees. But, bee sleep is different than human sleep. That’s what I found out from my friend Brandon Hopkins, a bee researcher at Washington State University. I asked him how you can tell if a bee is asleep. Sometimes other bees will try to help keep a bee from falling over. They actually hang onto the fellow bee’s legs so it won’t fall off the honeycomb. That’s some serious team work. The sleeping honey bee also relaxes its muscles so the upper body and rear-end droop a little. It’s wings may also rest on its body. Exactly where a bee sleeps depends on where it lives. More than 20,000 known species of bees live on our planet and we find them in different places. Honey bees work day and night and take shifts sleeping inside the hive. Their sleep patterns change as they grow up. Younger bees sleep a lot less than the older bees. The older foraging bees that collect pollen and bring it back to the hive have more of a regular sleeping pattern. It’s a little hard to say how long they sleep, but these older bees catch between 30 minutes and an hour and a half each night. To get all that rest, they take little sleeps, or catnaps, of about 15 to 30 seconds at a time. It’s very important that honey bees sleep, Hopkins explains. Researchers have found that older honey bees need sleep because it helps their memory. Yes, bees can learn and remember things, too. They need to have good memory to remember where they find pollen and nectar. In studies where bees stayed awake for long periods of time, scientists also found that bees were poor dancers. It’s ok if a human is a poor dancer, but honey bees dance to communicate with other bees and tell each other where they might find flowers. “If they are sloppy dancers, the hive becomes less efficient and won’t be able to collect as much nectar and pollen,” Hopkins says. Then again, not all bees live in live in hives or have a colony. Some are solitary bees, like the teddy bear bee. The teddy bear bee often bites into small branches and hangs there for the night. Other solitary bees will sleep in their nests or on plants. Now that you know bees sleep, maybe you’ll spot one taking a snooze in your neighborhood. Just be sure and let it rest. In meantime, you can watch this short video of a sleepy bee catching some z’s. How did you hear about Dr. Universe? Option: Upload your question in a video! Accepted file types: mov, mp4, . « How does sand stick together?